E - Tristan Alexander, Tuckahoe-1, sr.
E - Dustin Raynor, Maple Grove-6, sr.
L - Nick Gilbert, Onondaga-3, sr.
L - Ken Plue, Rensselaer-2, sr.
L - Craig Campbell, Oakfield-Alabama-5, soph. QB - Joe Melendez, Tuckahoe-1, jr.
RB - Mike Schmidlein, Chester-9, sr.
RB - Nick Jackson, Randolph-6, sr.
RB - Latavius Murray, Onondaga-3, jr.
RB - Lowell Robinson, Tuckahoe-1, sr.
RB - Matt Crandall, Cattaraugus-6, sr.
L - Jeff Daye, Delhi-4, sr.
L - John Ramirez, Tuckahoe-1, sr.
L - Shawn McGrath, Walton-4, sr.
L - Chris Williams, Oakfield-Alabama-5, soph. 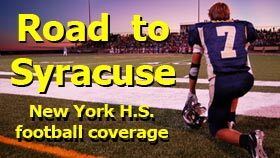 LB - Kyle O'Laughlin, Onondaga-3, sr.
LB - Willie McGinness, Bainbridge-Guilford-4, sr.
LB - Tim McElwain, Randolph-6, sr.
LB - Nate Rockefeller, Delhi-4, sr.
HB - Chris Hart, Onondaga-3, sr.
HB - Matt McCracken, Oakfield-Alabama-5, sr.
HB - Dan Ruffrage, Utica Notre Dame-3, sr.
E - Damian Tyler, Fort Edward-2, jr.
E - Josiah Jones, Onondaga-3, sr.
L - Mike Everett, Batavia Notre Dame-5, sr.
L - Karl Durant, Waterville-3, sr.
E - Matt Thibodeau, Fort Edward-2, sr.
QB - Tom Secky, Maple Grove-6, jr.
QB - Ryan Carpenter, Fort Edward-2, sr.
RB - Dustin Quick, Candor-4, sr.
RB - Adam Wright, C.G. Finney-5, sr.
RB - Nunzio Doldo, Watertown Immaculate Heart-3, sr.
RB - Anthony Molaro, Oakfield-Alabama-5, sr.
L - Brandon Sheehan, Fort Edward-2, sr.
L - Dwayne Downes, Tuckahoe-1, sr.
L - Andrew Apperson, Maple Grove-6, sr.
LB - Nick Black, Maple Grove-6, jr.
LB - Alex Ferrara, Salem-2, jr.
LB - Zach Fazio, Watertown Immaculate Heart-3, sr.
LB - Matt McCarthy, West Valley-6, sr.
L - Matt Stallman, Dolgeville-3, sr.
HB - Paul O'Brien, Whitehall-2, sr.
HB - Clifton Krotz, Cattaraugus-6, sr.
HB-K - Will Young, Hancock-4, jr.